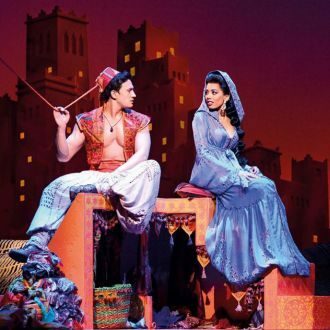 A Whole New World has opened up at the Prince Edward theatre now the hugely anticipated Broadway musical Disney’s Aladdin has arrived, on its flying carpet, for guests of Aladdin Theatre Breaks. With the continued success of Disney’s The Lion King still thrilling audiences in London 16 years on from its opening night and previous good form in the guise of Beauty and the Beast and Mary Poppins – the Disney company is no stranger to successful theatre breaks! A firm family favourite story, Aladdin is a street urchin in the city of Agrabah. He has a chance meeting with the Sultan’s daughter, Princess Jasmine, in the busy market place. Determined to drag himself out of the gutter and make himself worthy of Jasmine’s love, he agrees, for a fee, to find an old rusty lamp for a sorcerer, Jafar. But Aladdin finds himself left alone to perish in a deep cavern. However, all is not lost and with the help of a wish granting genie Aladdin’s amazing adventures have only just began. The show features the hit songs of the animated film, including Arabian Nights, A Friend Like Me, Prince Ali and A Whole New World. Also new songs have been written by Oscar winning composer Alan Menken. Disney’s Aladdin Ticket and Hotel Breaks The Prince Edward theatre is just off Shaftesbury Avenue. Nearby hotels include the four star Radisson Blu Edwardian Mercer Street Hotel and the three star St Giles Hotel – perfect for Aladdin Theatre Breaks. For budget breaks we can also offer the Covent Garden Travelodge. If you do not need to be within walking distance then the theatre is just a short walk from Leicester Square Tube station from which you can easily travel to Victoria, Bloomsbury, Kensington and Knightsbridge where even more hotels can be found to suite your requirements. Was soooo looking forward to seeing Aladdin as its one of my favourite 'modern' Disney films and, on most levels, it didn't disappoint.Bursting with colourful sets, costumes and amazing special effects the show carries you along on it's magic carpet ride of Arabian adventures with the actual carpet ride when Aladdin & Jasmine sing "A Whole New World" a really spectacular moment. Whilst everyone in the cast plays their parts as directed its the fabulous GENIE who moves the show along and steals every scene he's in - hence the well deserved standing ovation for Trevor Dion Nicholas. My only gripe - and really it is my only gripe - why did everyone have American accents? As bizarre as the Arabian bizarre of Agrabar! Aladdin (the show) was good fun and the set and costumes were bright, colourful and perfect. Aladdin (the actor) was a bit of a disappointment unfortunately. His dancing was good and he looked the part, but his voice isn’t really up to the job (we assumed he was unwell, however a conversation on the tube home revealed that others felt the same way). That said, it did not spoil the show at all. If I had any complaint it would have been the heat. I felt quite unwell and during the interval I went to talk to a staff member as the heat was making me feel quite sick (we were in the top circle, otherwise known as the nosebleeds), the advice I was given “feel free to come and sit in the bar if you are too hot” and he didn’t seem to see my point that I would then miss the show that I had paid to watch! The hotel was nice enough.